HBO will debut a new animated series starting February 19th based on the popular podcast The Ricky Gervais Show. Those unfamiliar with the podcast can get a more in-depth primer on it and the animated series from the Toronto Star, but the gist is three funny guys sit in a studio and riff about what ever strikes their fancy. 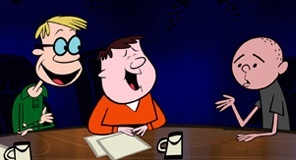 Though, more often than not it is Gervais and co-host Stephen Merchant jibing producer Karl Pilkington’s unique take on things. But what works in audio form may not be suited for TV. The Hollywood Reporter review says the show “could have worked as a series of five-minute YouTube segments”. But with fans who put their show into the Guinness World Records for world’s most downloaded podcast, Gervais and his crew are hoping for something more.